Watching the process of collecting my eggs to the incubation and hatching my chickens. What a pleasure! I enjoy being mother hen. Admittedly there are many rules to follow, but if you do your steps properly you will have success raising your chickens. We purchased an incubator from brookfield poultry supplies a while back now and have been learning all about the process of incubation and looking after my chickens. Maximum of 6 healthy hens to 1 rooster. This is to obtain good fertility results. 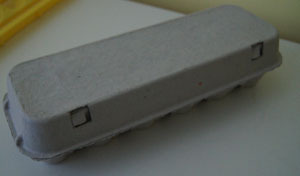 Collect eggs in new egg carton and try not to handle them too much. Old used egg cartons can sometimes carry disease especially if you have repeatedly used the egg carton for other chooks. Make sure that your incubator is clean. I clean mine thoroughly with a good non toxic cleaner then wash again with a food safe disinfectant. Scrub your trays and use a compressor if you have one all around the mechanics to ensure that particles of dust and foreign objects are not left for future settings. I recommend an incubator with a fan. This helps to keep the temperature even. I also recommend an automatic egg turner. This takes away the worry of turning your eggs every day. This also removes the constant handling of your eggs. If you do not have an automatic egg turner, make sure that you wear hygienic gloves each time your have to handle your eggs. You will need to turn your eggs at the least twice a day. 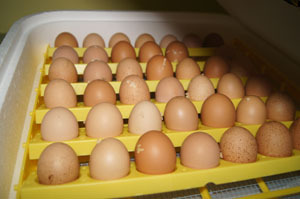 In the automatic egg turner, eggs are turned every 4 hours. Read your instructions for your incubator. 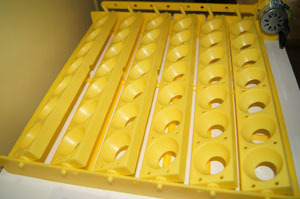 I use the hovabator from Brookfield Poultry Supplies which carries 42 eggs in 1 setting. Make sure that you turn your incubator on well before you place eggs within. The temperature has to be correct. The temperature also has to be stable. I always try and have my incubator set between 36c at the absolute lowest point and 39c at the highest point. There has been few breeders recommend to me (mind I not sure on the truth of this) to keep the temperature on the lower end as this is suppose to give you more girls. I am not sure on the logistics of this statement, but I do try and not let the incubator get too high in the temperature range. So far I have been hatching out more girls than boys. At the 7-9 day of incubation, I candle my eggs to check for fertility. Please at this stage try not to handle the eggs. A good candler is used by just shining from the top of the egg. If you see a reasonably clear egg you are fairly certain that the egg is not fertile, these eggs should be removed from the incubator. Fertile eggs will have a series of reddish coloured veins appearing. Humidity in your incubator is very important, so please again read your instructions that come with your incubator. The hovabator has a plastic tray in the bottom. This has some molded channels that you fill with water. I fill only one of the channels in the first part of the incubation period, and then on the final few days when it is time to remove the automatic egg turner, I fill another channel with water to increase the humidity to help with the hatching. Try not to over do the humidity as this can lead to the chickens stay wet in the incubator for longer period than necessary. During the time that your chickens are hatching. It is imperative that you do not open your incubator, and if you need to open it, make sure you are very quick. As this changes the temperature and humidity within the incubator.